As a number of outlets have reported, Ron Wyden has placed a hold on the Intelligence Authorization in an attempt to thwart FBI’s quest to be able to obtain Electronic Communication Transaction Records with just a National Security Letter. But Wyden’s released statement on that hold differs in emphasis from what he said in his Senate address announcing the hold yesterday. The statement describes how all toll records — from emails, texts, or web browsing — can infringe on privacy. The fact of the matter is that ‘electronic communication transaction records’ can reveal a great deal of personal information about individual Americans. If government officials know that an individual routinely emails a mental health professional, or sends texts to a substance abuse support group, or visits a particular dating website, or the website of a particular political group, then the government knows a lot about that individual. Our Founding Fathers rightly argued that such intrusive searches should be approved by independent judges. 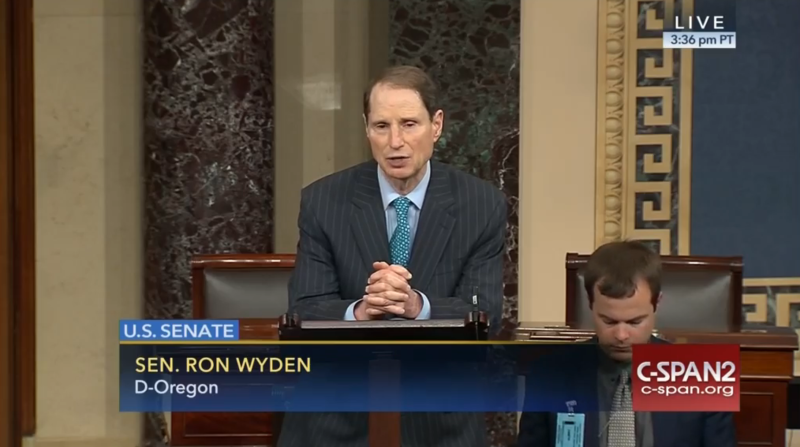 But in his floor statement, Wyden went on at length about the particular threat posed by obtaining web browsing history (this starts after 4:40). And the answer to that question, Mr. President, is yes, the government can. The government can get access to web browsing history under the Intelligence Authorization legislation, under the McCain amendment, and they can do it without getting a warrant, even when the government can go get it without a warrant when there is an emergency circumstance. Now the reality is web browsing history can reveal an awful lot of information about Americans. I know of little information, frankly Mr. President, that could be more intimate than that web browsing history. If you know that a person is visiting the website of a mental health professional, or a substance abuse support group, or a particular political organization, or — say — a particular dating site, you know a tremendous amount of private and personal and intimate information about that individual — that’s what you get when you can get access to their web browsing history without a warrant, even when the government’s interest is protected, as I’ve said, in an emergency. The reality is getting access to somebody’s web browsing history is almost like spying on their thoughts. This level of surveillance absolutely ought to come with court oversight, and as I’ve spelled out tonight, that is possible in two separate ways — the traditional approach with getting a warrant, and then under Section 102, which I wrote as part of USA Freedom Act, the government can get the information when there’s an emergency and come back later after the fact and settle up. Wyden’s statement makes a few other things clear. First, by focusing on the emergency provision of USA Freedom Act, Wyden illustrates that the FBI is trying to avoid court oversight, not so much obtain records quickly (though there would be more paperwork to a retroactive Section 215 order than an NSL). That means two things. First, as I’ve noted, FBI is trying to avoid the minimization procedures the FISC spent three years imposing on FBI. Right now, we should assume that FISC would prohibit FBI from retaining all of the data it obtains from web searches, but if it moved (back) to NSL collection it would have no such restriction. The other thing obtaining ECTRs with NSLs would do, though, is avoid a court First Amendment review, which should be of particular concern with web search history, since everything about web browsing involves First Amendment speech. Remember, a form of emergency provision (one limited to Section 215’s phone chaining application) was approved in February 2014. But in the September 2014 order, the FISC affirmatively required that such a review happen even with emergency orders. A 2015 IG Report on Section 215 (see page 176) explains why this is the case: because once FISC started approving seeds, NSA’s Office of General Counsel stopped doing First Amendment reviews, leaving that for FISC. It’s unclear whether it took FISC several cycles to figure that out, or whether they discovered an emergency approval that infringed on First Amendment issues. Under the expanded emergency provision under USAF, someone at FBI or DOJ’s National Security Division would do the review. But FBI’s interest in avoiding FISC’s First Amendment review is of particular concern given that FBI has, in the past, used an NSL to obtain data the FISC refused on First Amendment grounds, and at least one of the NSL challenges appears to have significant First Amendment concerns. In the Senate yesterday, Senator Wyden strongly suggested the FBI wants this ECTR provision so it can “spy on their thoughts” without a warrant. We know from other developments that doing so using an NSL — rather than an emergency Section 215 order — would bypass rigorous minimization and First Amendment review. In other words, the FBI wants to spy on — and then archive — your thoughts. Monday: Fierce Dog Facebook’s Flip-Flop: Is It a Law Enforcement Thing?